Set off on an overnight fishing trip with the LEGO 60182 City Pickup and Caravan. This feature-packed set has everything minifigures need for camping adventures. Hitch the cosy caravan to the pickup truck and let the minifigure family hop on board for a fun vacation. Pack up the camping and fishing equipment to get ready for an adventure in nature—and don’t forget the camera accessory! The caravan section of the LEGO 60182 City Pickup and Caravan offers hours of build and play fun. Open the side of the caravan or remove the front roof to access the inside, where minifigures can sit at the buildable table and chairs, snooze in the bedroom and relax on vacation. You can even stand the caravan on its own with the support leg. 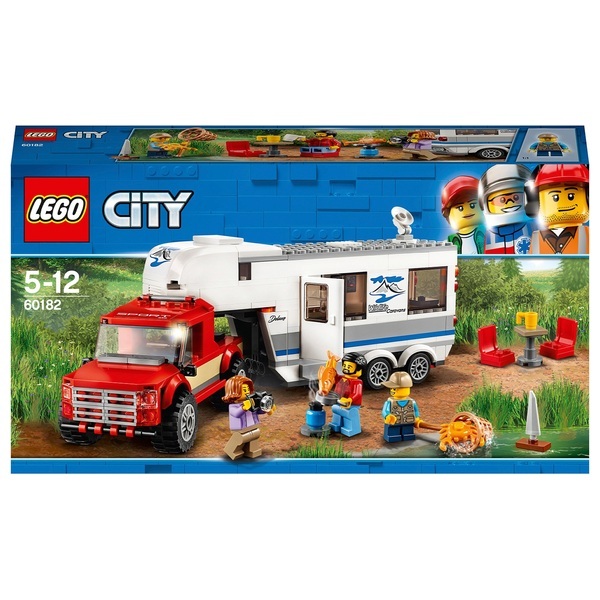 Drive the LEGO 60182 City Pickup and Caravan to the best camping spot in the forest and unpack the fishing net to catch some dinner. This set comes with a net accessory, a fish, a gas fire piece and a pan kids can imagine cooking dinner on. Act out riverside advntures with the Mom, Dad and Son minifigures, as well as the cute crab figure and a toy ship.